In early September 2010, a major diplomatic row broke out between Japan and China when the captain of a Chinese trawler was arrested and taken into custody by Japanese authorities after his vessel collided with two Japanese Coast Guard (JCG) vessels in waters in Japan’s 22-kilometer contiguous zone off the Senkaku Islands, Japanese islands also claimed by China. The trawler collided with the Japanese vessels after it ignored orders to stop. The captain, 41-year-old Zhan Qixiong, was held on charges of illegally fishing in Japanese waters, trying to evade an inspection by the Japanese Coast Guard (JPG) and obstructing JCG duties by deliberately ramming the trawler into the JCG ship. The Chinese claim the trawler was not fishing illegally because the islands belong to China. Fourteen other Chinese crew members were initially detained but they were soon after released. Only Zhan was detained for a length of time. The Japanese claimed the matter would be dealt with in accordance with Japanese law. Video images of the collision clearly show that the Chinese trawler deliberately ramming the JCG patrol vessel Mizuki. Japanese foreign minister Seiji Maehara told reporters, “It was clear the Chinese fishing boat rammed into [the JCG vessel]. If it wasn’t intentional [the Chinese boat] would’ve reversed its engines and tried to move but the footage doesn’t show that.” The video also shows the Japanese and Chinese vessels initially going on a parallel course with the Chinese trawler then veering towards the JCG boat. A spokesperson for the Chinese government said the islands were “inherently the territory of China” and warned that “if Japan continues in this reckless fashion, it will taste its own bitter fruit.” Beijing lodged several complaints about the arrest of the captain including one by a high-level deputy prime minister in which the Japanese ambassador was summoned in the middle of the night. China also called off talks on resolving disputes on claims over natural gas deposits in waters near the islands. Tours by Chinese to Japan were cancelled and invitations to Japanese students to visit Expo 70 were withdrawn. Travel companies in China were told by the government to refrain from arranging package tours.Concerts b the Japanese pop group SMAP were postponed. An art show in Beijing with participants from Japan was canceled. The story was at the top of the news in China and Japan almost everyday during the stand off, with some Chinese sources saying the whole thing was orchestrated by the Japanese government so it didn’t come across as being so militarily weak. A number of Japanese canceled the travel plans to China. Four Japanese nationals, employed by Fujita, a second-tier general contractor, were detained in Hebei Province in China for allegedly entering a military zone on the outskirts of Shijiazhuang without permission and videotaping facilities there. The Fujita workers were in China researching the disposal of chemical weapons left in China by Japan after World War II in hopes of getting a Japanese -funded contract to dispose of them. They were scheduled to stay in China for two or three days. There were fears of a serious economic fallout over the issue such as a boycott of Japanese goods or retaliation again factories producing Japanese goods in China or against Japanese citizens. China did impose an effective ban on the exports of rare earths and silicon---materials critical in the electronics and automobile industry and of which China is one of the sole suppliers---by initiating customs procedures such as requiring documents to be in Chinese, a deviation from usual practices, that halted the shipments. All 31 Japanese company involved in he rare trade said their businesses had been hampered by the Chinese export restrictions. Chinese Premier Wen Jiabao demanded that the Japan “immediately and unconditionally” release the captain of the trawler that collided with the Japanese coast guard ship. “The Diaoyu islands are China’s sacred territory, the arrest of the captain is definitely an illegal act,” he said, adding that the Chinese government has taken measures it has because “Japan has made no effort to listen to us.” He said “If Japan goes its own way and continues with judiciary proceedings, China will take further action. Japan should bear all responsibility for the serious consequences that will arise” from its action. Japan insisted it would follow domestic law and not let foreign pressure decides the case. Jiabao ruled out meeting with Japanese leaders and suspended Chinese government contacts with Japan. Chinese nationalists staged anti-Japanese protest that in some cases became violent when Chinese security forces tried to break them up. One boisterous demonstrations with around 100 Chinese activists was staged outside the Japanese Embassy in Beijing. Some protesters there carried signs that read “Burn you Japan !” and shouted “Boycott Japanese products!” The were also protests outside Japanese consulates in Shanghai, Shenyang and Shenzhen. Thousands took to the streets in Chengdu, unfurling banners and shouting slogans such “Defend the islands” and “Fight Japan.” Protestors there broke into the Japanese retailers Ito-Yokado and Isetan and broke windows. One witness told the Yomiuri Shimbun, “One after another, young people on the roadside joined the procession of university students, and the number of protestors quickly swelled...Police soon lost control.” In Tianjin an international school was attacked by angry Chinese. In Xian, thousands of college students marched while holding flags and banners, shouting slogans such as “Boycott Japanese goods.” Windows were broken and display cases were shattered at Mizuno and Sony retail stores. A chat room for the Chinese newspaper Global Times was shut down because of anonymous calls for the slaughter of Japanese citizens. Japan’s Foreign Minister Seiji Maehara gave Beijing some credit for its efforts to reign and limit in the protests. Chinese Foreign Ministry spokesman Ma Zhaoxu spoke out against acts of violence by demonstrators but showed no opposition to the protests themselves. Ma accepted anti-Japan demonstrations as a "display of patriotic passion," saying: "It's understandable that some people expressed their outrage at the recent erroneous words and actions of the Japanese side [over the Senkakus]." There were some anti-Chinese rallies in Japan. At one in event in Tokyo about 1,000 people gathered and carried banners with messages such as “Japan is in Danger!” and “Don’t Forgive invader China .” Some of the largest cheers rose up from the crowds when a nationalist politicians accused China for being ungrateful for all Japan has done for it. Some analysts said he protest were more of a manifestation of bent-up frustrations by Chinese university students than overt hostility towards the Japanese and the trawler collision and islands were mainly a trigger for the anger. Chinese pundits predicted the Japanese would eventually cave in to Chinese demands. Zhou Young, a professor of Japanese Studies a China Foreign Affairs University told Kyodo, China has “more cards in its hand than the Japanese as their economy is largely dependant on China.” Some analysts argued that China had chosen this moment to play hardball with Japan to take advantage of Japan’s relatively inexperienced government and deteriorating relations between Japan and the United States over the Futenma Air Base in Okinawa. Former Deputy Secretary of State Richard Armitage said China was taking advantage of a “chill” in Japan-U.S. Relations and that Beijing was “testing what the could get away with.” he also saw the move as warning to Vietnam, Malaysia, Brunei and the Philippines over the Spratly Islands. Other countries---namely Russia’seemed to use the dispute as an opportunity to give Japan a hard time or put pressure on it. Russian President Medvedev called the Kurils---a group of island claimed by both Japan and Russia but occupied by Russia—“a very important region for our country” and said he planned to be the first Russian leader to visit them. He did this around the same time he met Chinese President Hu Jintao to commemorate the end of World War II, during which both Russia and China were adversaries of Japan. The leaders of Russia nad China seemed very friendly. They signed a joint statement of cooperation that among other thing stated that Japan “fabricated history” to stake its claim on the Senkaku islands. The United States asked Japan to stop its development of an oil field in Iran, and Japan did. Around the time of the island dispute the Japanese defense ministry released a white paper expressing concern about China’s military build up and the movement of what appeared to drilling equipment into a gas field near the disputed islands by Chinese ships. Many wondered why the Japanese politician Ichiro Ozawa---who has good connections with Chinese leaders but just lost a DPJ leadership race to Prime Minister Kan---and other Japanese politicians with good connections in China didn’t try to exert more ifleunce to end the crisis. Some Japanese officials said the Chinese military was behind China’s hardline stance on the Senkaku Islands, saying it was in charge of policy during the dispute rather than China’s Foreign Ministry, which normally handles such matters. Some analysts said the way China behaved during the island dispute was a sign that the Chinese military had gained more influence in foreign affairs. One diplomat told the Los Angeles Times, “The military has its own interests. The greater the tensions, the bigger the budget they get.” Some think that China’s hardline stance had something to do with the showdown between military leaders and political leaders in China in the run up to selecting new leaders and filling other important positions in 2012, when President Hu Jintao and Premier Wen Jiabao have to retire. As for relying on fishermen, military exercises off the coast of Fujian Province and comments by Chinese officials show that the Chinese Navy has been trying to “more effectively organize China’s maritime militia, based on various fishing fleets,” Mr. Cole said. “The maritime militia in 2010 is quite active.” A Pentagon report last year noted that in May 2008, two Chinese warships were supplied with ammunition and fuel at a designated spot off Zhejiang Province by fishing vessels that belonged to the naval militia. About two weeks after the collision between the Chinese trawler and the Japanese coast guard ship, the captain of the trawler was set free by a court in Naha, Okinawa, which had jurisdiction over the case. Prosecutors said it had taken into account Sino-Japanese relations, but made its decision based on the fact it couldn’t prove the Chinese captain deliberately rammed the Japanese vessel. No one believed that the court made the decision by itself. The understanding was that it had been pressured to release the captain in some way by the Japanese national government. The decision came soon over Chinese authorities arrested the four Fujita workers in China. The captain was taken to China in a private get chartered by the Chinese government. He received a hero’s welcome on his return to China. When he got off the plane he raised both hands into the air and made V signs. (Charges against him were dropped in January 2011). The release of the Chinese captain was widely seen within Japan and by the international community as Japan being “weak-kneed” and caving in too easily to China’s demands. Opposition parties had a field day criticizing the Kan government for bowing to China. Conservative LDP lawmaker Mobuteru Ishihara said, the government’s response was “diplomatically tone deaf and a historic blunder.” At the time of the captain’s release both Japanese Prime Minister Naoto Kan and Chinese Premier Jiabao were in New York. Each had contacts with U.S. government, giving the impression that Obama administration wanted the matter settled as soon as possible and it had pressured Japan. However Kan denied any political pressure had been put on Haha prosecutors to release the captain. Japan was shocked by China’s demand for an apology and compensation. In response Japan demanded compensation for damage to the Japanese coast vessels and sent more patrol boats into the South China Sea. Japan proposed stationing troops near the Senkaku islands. Finally, about five days after the captain was released China began to back down. The rhetoric was toned down. Customs procedures returned to normal and shipments or rare earths and materials resumed. Perhaps the biggest sign that things were finally mellowing was the selection of a Japanese woman in a China panda keeper contest. Three of the four Fujitsu workers were freed. China’s Xinhua news service said the three “had acknowledged they had been engaged in activities that violated Chinese laws and submitted a document stating they repented their mistake.” On their returns to Japan the Fujiata employees said they didn’t know they had enters a restricted area. The last Fujita worker was released about three weeks after the four were arrested. In early October Japanese Prime Minister Naoto Kan flew to Brussels to attend the biennial Asia-Europe Meeting, a meeting he initially had not planned to attend, so he could talk to Jiabao, who was also at the meeting. The leaders met informally for a 25-minute “chat,” according to the Chinese, in a hall using an interpreter that spoke English but not the other’s language. The Japanese foreign ministry initially said the meeting “began spontaneously while the two leaders were walking” in the same direction but later it was revealed that the meeting had been arranged---albeit hastily---15 minutes before. Both Kan and Jiabao stood by their country’s claims to the islands but agreed bad relations between the two countries served no one’s interest and agreed to improve bilateral relations, resume exchanges and hold high-level talks in the near future. The day after the meeting, Chinese vessels that were patrolling the near the disputed islands withdrew. Later in October at an ASEAN summit in Hanoi, a meeting between Wen and Kan was cancelled by China just minutes before it was supposed to begin. At that time Chinese Assistant Foreign Affairs Minister Hu Zhengyue accused Japan of “bandying words infringing on China’s sovereignty and territorial integrity.” At the last minute a ten minute meeting was hastily arranged. Perhaps most embarrassing for Japan was a photo op in which it appeared that Wen refused to shake Kan’s hand and the President of South Korea Lee Myung Bak had to force the Chinese and Japanese leaders to join hands. 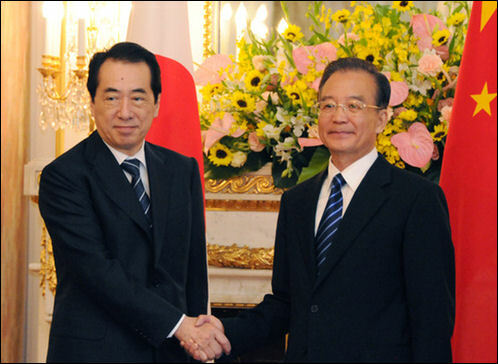 Kan met with Chinese President Hu Jintao for 22 minutes during the APEC summit in Yokohama in November 2011. In the meeting Kan said he told Hu “the Senkaku Islands are the inherent territory of Japan” and “there’s no territorial dispute---over the islands. In photos from that meeting Hu looked uneasy to be in the presence of the Japanese leader. Many analysts felt that Japan emerged from the island dispute looking weak and at the mercy of economic pressure applied by China. Others felt that although China might have scored points among nationalists and demonstrated its strength it damaged its international reputation by coming across as bully quick to resort to extreme measures and use any means possible to get its way. The incident certainly raised fears and suspicions among Japanese. A record 84 percent of respondents in a Yomiuri Shimbun survey said they did not trust China, 89 percent said China’s perceived retaliation was excessive and 94 percent said that China’s demand for an apology was unacceptable. Kan’s handling of crisis resulted in a drop of his approval rating from 66 percent to 53 percent. The number of Chinese tourists visiting Japan and the number of Japanese tourists visiting China fell. The whole incident raised worries about how potentially volatile relations are between China and Japan and how poor communication is between the two countries, how small players like boat captains and nationalist can shape events and how few checks there are preventing things from getting out of control. It also stressed the importance of Japan joining forces with the United States., South Korea and the ASEAN nations of Southeast Asia to from a united front to address China’s truculence. In November 2010, video footage of the collision was leaked on the Internet by a 44-year-old Kobe Coast Guard officer. He posted the video on YouTube after footage sent to CNN was not broadcast. The leaker, Masaharu Issiki, who had access to the video through his job, said, “I wanted as many people as possible to see the truth...I believed [posting the footage] would really benefit the country and the public. I thought about what is more important and decided to act.” Issiki resigned from his post after the incident. In January 2011, criminal charges against Issiki were dropped. The video backed up reports made earlier. It was somewhat of an embarrassment to the government that video was leaked but on other hand it backed up assertion that the Chinese trawler was the aggressor. Some Chinese that saw the video said that it clearly showed the Japanese were the aggressor and that the big Japanese coast guard vessel bullied the smaller Chinese ship. After the island dispute Chinese boats were periodically spotted in the area of the disputed islands. In November 2010 a Chinese surveillance-patrol vessel equipped with helicopters took up position around the Senkaku Islands. In March 2011, Japanese Air Self-Defense Force jets were scrambled after two Chinese navy planes approached within 50 kilometers of the Senkaku Islands. In December 2010, two fishermen were killed and three were detained after a 63-ton Chinese trawler capsized and sank after ramming a 3000-ton South Korean Coast Guard patrol vessel. The trawler was illegally fishing in South Korea’s Exclusive Economic Zone. The three fishermen attacked the South Korea coast guard officers with iron pipes and shovel but were ultimately freed after protest from the Chinese government. In December 2011, Japan attended ceremony for the Nobel Peace Prize presentation to Liu Xiobo while many other countries bowed to Beijing pressure and didn’t attend. In January 2011, Japanese prosecutors decided to drop their cases against the Coast Guard officer who leaked the video of boat collision and the Chinese captain of the trawler. in March 2011, a Chinese oil company official said China would unilaterally develop the Chuxiao (Shirakaba) natural gas field. In April 2011, the Japan Coast Guard seized a Chinese fishing trawler off Kagoshima. It happened about a month of the tsunami disaster in Japan and not a big issue was made of it. In June 2011, a Chinese ocean research ship sampled waters in Japan’s exclusive economic zone off northern Honshu without prior notice and 11 Chinese Navy warships passed between Okinawa and Miyakojima of Okinawa Prefecture and conduct exercises in the Pacific and returned back to China between the same islands. China sent earthquake rescuers and extended its “deep sympathy and solicitudes to the Japanese government and people.” The message was the friendliest exchanges out of Beijing towards Japan in months and an encouraging sign that relations between the two nation were on the mend after reaching a low poin six months earlier after a Chinese fishing boat collided with Japanese Coast Guard vessels near a group of disputed islands in the East China Sea. 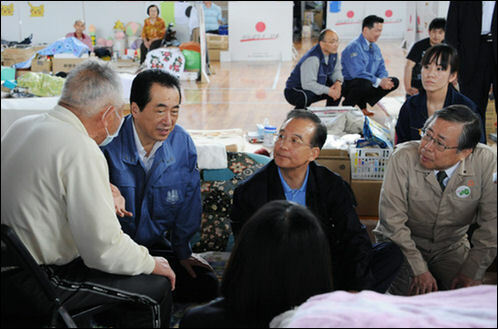 The government has also donated 30 million yuan ($4.56 million) of relief supplies to Japan that included quilts and tents, and dispatched a 15-member rescue team that headed immediately to the main quake zone upon landing in Tokyo on a chartered flight to help search for survivors, according to official news agency Xinhua.. Chinese President Hu Jintao sent a message to Japanese Emperor Akihito on Monday expressing sympathy for the victims of the disaster and the Chinese government's willingness to provide all "necessary assistance." Reuters reported: “China's state-run television news has given over hours of live coverage to the disaster, largely displacing its dry reports on a meeting of China's rubber stamp parliament. While some nationalists have voiced satisfaction online at the sight of China's neighbor stricken by catastrophe, grief and sympathy have been much more common reactions, sometimes mixed with a political message. "I hope the Japanese persevere. We sympathize with the scale of the disaster they are facing," wrote one reader on the website of the Global Times, a normally stridently nationalist tabloid. Many Chinese were concerned about radiation from Japan blowing towards China. There were also worries about food imports from Japan being contaminated with radiation. For a while there panic buying of Japanese salt both as a measure to stave off thyroid radiation poisoning and because many Chinese like Japanese salt and were worried about shortages. “Nonetheless, in downtown Beijing, Huapu Hypermarket sold out of salt Thursday morning. Clerks stocked five shelves with bags of rice instead. In a 10-minute period during the midafternoon, seven customers arrived asking for salt, including the 45-year-old mother of a toddler who said she had learned of its health benefits against radiation from QQ, one of China’s most popular Internet chat sites. According to the JCG, one of its patrol boats spotted the two vessels--the Yuzheng 201 and the Yuzheng 31001--sailing about 30 kilometers north-northeast of Kubajima island at about 6:15 a.m. The Yuzheng 201 entered Japanese territorial waters at 6:36 a.m. and the Yuzheng 31001 at 6:44 a.m. The vessels left the waters at about 7:15, but about 20 minutes later the Yuzheng 201 reentered the territorial waters for seven minutes. Administrative Vice Foreign Minister Kenichiro Sasae summoned Chinese Ambassador to Japan Cheng Yonghua to the Foreign Ministry on Wednesday morning to protest the intrusion. Sasae told Cheng, "It cannot be regarded as innocent passage permitted under international laws," and demanded Beijing take measures to prevent a recurrence. However, the Chinese ambassador reiterated Beijing's claim that the Senkaku Islands are part of China's territory. Analysts said Beijing again timed its aggressive action on Senkakus to coincide with power vacuum in Tokyo: this time as Prime Minister Naoto Kan was preparing to step down and the ruling Democratic Party of Japan occupied with preparations for selecting a new leader. China apparently believed the intrusion might not meet a strong political response from Tokyo. In late September 2011, a a Chinese marine research vessel was spotted in Japan’s 200 nautical-mile economic exclusion zone (EEZ) off Kumejia Island, about 100 kilometers west of the main island of Okinawa.